When we first saw this dark mass from afar, sleeping under a tree, we weren't quite sure what it was. As we drove closer, we realized it was a rhino. Oxpeckers can dig into the flesh of animals to extract parasites, ticks and other insects that may burrow under their skin as is the case of this kudu. We spotted this scenario in our yard. Sadly once the insect is extracted, the oxpecker may continue to peck at the injured site, making matters worse. As mentioned in yesterday's bushbaby post (click here to see it if you missed it), when the Wi-Fi went down in the area and unable to complete the post at that time, we decided to drive to Kruger National Park's Crocodile Gate entrance. Kruger is huge as indicated here: "The largest game reserve in South Africa, the Kruger National Park is larger than Israel. Nearly 2 million hectares of land that stretch for 352 kilometers, 218 miles (20,000 square kilometers, 77 square miles) from north to south along the Mozambique border, is given over to an almost indescribable wildlife experience." We'd seen rhino while on safari in the past, but never lying down like this. Our hearts were racing with excitement. Notice the two cattle egret sitting atop the rhino. As mentioned, many have stated it's necessary to enter the park early in the morning in order to see much wildlife since many species seek shelter during the heat of the day. That makes a lot of sense. This may generally be true but on several occasions during our last self-drives in Kruger, we'd seen plenty of wildlife midday. Also, with the Wi-Fi out in Marloth Park at least we could go to the entrance gate at the Crocodile River and sign up on-site for a one year pass to the park, referred to as a Wild Card. We were hopeful she/he would stand up. There is a daily fee of ZAR 318 (US $27.02 per adult, per day) for foreigners to enter Kruger National Park. At a combined cost for both of us at ZAR 636 (US $54.04), it would take only six day's entrance fees to make purchasing the ZAR 3800 (US $322.92) a sensible situation. We spotted another big animal at a short distance and drove a little further down the dirt road, hoping she'd be standing when we returned. Alas, safari luck kicked in and she was on her feet when we returned only five minutes later. Surely, during our combined total year in South Africa, we'll be in and out of the park more than six times, especially based on yesterday's stunning experience (not to be expected on each occasion). Also, the pass allows access to dozens of other parks in South Africa, some of which we may visit down the road. We'd attempted to purchase the Wild Card online but the website was very confusing. Usually, with patience and perseverance I can usually figure out such a site but in this case, it was nearly impossible. This view was slightly obstructed by the brush but we maneuvered the car for better views. Instead, Louise explained we could buy the Wild Card at the gate which took about 20 minutes including waiting time for our turn. Of course, its required to have passports on hand. Credit cards are accepted for payment. Nearby at another tree, we spotted a rhino mom and her baby, born this season and still closely attached to the mother. Once the Wild Card's "temporary" pass is issued, it's required to complete the application online in order to have the permanent card mailed to the purchaser. Louise gave us her address since mail isn't delivered to this holiday home. Based on what we've read online, it could take a few months for the permanent card to arrive. In the interim, we can use the temporary pass to enter at any time we so desire. As often is the case, there's a warthog nearby longing to be in the photo. Upon closer inspection, it appears there were two warthogs standing next to the rhino. ﻿For those who may be attempting to complete the purchase of the Wild Card online (can't be done in person), be aware that finding the page to enter the mailing address is tricky to find. Here's the link to complete the purchase of the Wild Card. With our temporary card on hand, we were able to enter the gate and proceed on our way. But first, we needed to buy a map at the rest stop/souvenir shop near the Crocodile Bridge entrance where there's a petrol station, restrooms (no restrooms available further in the park) and a few campsites. Rhino mom and baby lay back down in the shade. ﻿We entered the souvenir shop and purchased a recent version of a comprehensive map booklet at a cost of ZAR 120 (US $10.23). While I purchased the map, Tom borrowed a squeegee from the petrol station and washed the little car's dirty windows. Next time, we'll do this before we leave for the park. Our expectations for the day were relatively low when we didn't get on our way until 10:15 am, late for any major sightings. We figured we'd spend a few hours driving on the paved roads and if we didn't see much after an hour or so, we'd turn around, and plan to arrive another day, earlier in the morning. With 150 mammals species and 500 birds in the park, surely we'd find a few photos ops to begin sharing with all of our readers. Little did we know, we'd have such a spectacular day, that now we're convinced we can visit Kruger at any time of the day as the mood strikes us and when possible, go early in the morning. Young rhinos typically stay with their mom until they're three years old after which they venture off on their own. ﻿As we began the over two-hour self-drive in the park, we were stunned by how much we spotted. We needed to get back before too late in order to do the day's post and by 1:30 pm we were back at the house on quite a high from our experience and subsequent photos. By dinner time, I'd uploaded yesterday's post. After dinner, we reviewed our photos on the flat screen TV using our new HDMI cord. It was quite a treat to see the photos we'd excitedly taken during the relatively short period of time. Now, we're anxious to return and may do so once a week going forward. Back down, they went to finish their nap in the shade. Mom realized we weren't a threat and relaxed with her beloved offspring. ﻿Tomorrow, we'll share more photos from our adventure, naming it _ _ _ _ _ _ _ _ day. Can you guess what that may be? This is one of our favorite photos in Tasmania, taken through the glass of the living room window as the sun began to set. For more photos and final expenses for our six-week stay in the Huon Valley, Tasmania, please click here. What a face! Lisa and Doc, the tiniest of the rescue bushbabies. Sweet Ms. Bushbuck stops by every day for a warm welcome and pellets eaten from my hand. Its a treat for her and a bigger treat for us. This morning awakening by 4:30 am, we were determined to get up and out the door early to head to Kruger National Park where we'd purchase an annual pass, called a "Wild Card" allowing us access at any time for a one-time annual fee. Although we'd been to Kruger many times in the past, each occasion presented us with a wide array of new and unique experiences we've both longed to see once again; elephants on the road, crocs in the river; rhinos grazing in the savanna, giraffes lumbering through the trees, herds of cape buffalo and of course, the much sought after lion or leopard sighting and so much more. Lisa makes little plates of food for the bushbabies which they nibble on for hours. One of the less-well babies must be fed every three hours including during the night which Lisa doesn't hesitate to do with unselfish love and concern. A sighting of any one of the above and any others would provide for a highly successful day and we don't hesitate in our desire to see these majestic animals in the wild. But, after getting up and dressed and throwing open the massive wooden doors to the veranda, we found ourselves in a quandary...there were countless wild animals in our yard. Should we stay or go? Bushbabies like worms as well as soft foods. 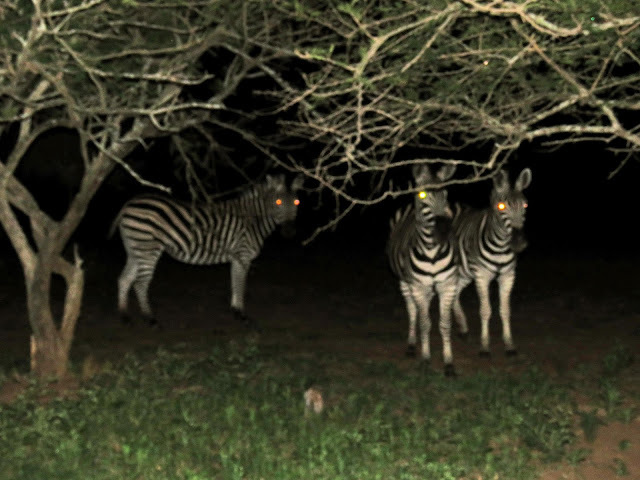 Quickly, we loaded the yellow plastic container with pellets and grabbed a camera, finding ourselves entrenched in the scene before our eyes, we decided to wait until another day to visit Kruger National Park. After taking countless photos and tossing and hand-feeding pellets to the many visitors that gradually wandered off to their next stop, we grabbed our coffee and tea sitting down at the big table on the veranda, ready to begin telling the story of last night's visit to Lisa's home a few kilometers from here. The four bushbabies spend their quiet time together (they are nocturnal) inside this flannel bags in Lisa's closet. When we arrived, all four were awake and ready to see who'd arrived for a visit. We'd heard so much about the tiny bushbabies Lisa's been nursing to health as a part of hers and Deidre's non-profit organization, Wild & Free Rehabilitation Centre based in Marloth Park and Hoedspruit. We were anxious to see Lisa's rescued bushbabies that she handles with the ultimate of love and care until they're ready to be released into the wild. This up close and personal experience was a treat! Well, wouldn't you know, no more than 10 minutes after we finally sat down to begin today's post, the Internet went down. After waiting 15 minutes, the message was clear, this would be a perfect time to head to Kruger, sign up for the Wild Card and spend a few hours driving through the park. Tomorrow, we'll share our totally unexpected "safari luck" experience with some amazing photos we can hardly wait to post. Who knew that late morning and midday self-drive photo safari would prove to be so exciting? Perhaps, this purported morning window of opportunity doesn't hold much water after all. They are shy and yet curious little animals. They love for Lisa to massage and tickle them, moving around to accommodate her gentle touch. As soon as we arrived at Lisa's home (the same site where the bush movie and fundraiser for Wild & Free was held on Saturday night) she escorted us to her bedroom where she cares for four bushbabies who happen to reside in her bedroom closet, which by the way, was meticulously clean and tidy. We simply could not believe our eyes! We've seen bushbabies in both Kenya and South Africa, usually adults but never quite so close up. With their big eyes, adorable faces and fluffy hair, they are quite a sight to behold. The tiniest of the four needs a special tonic several times a day. Watching Lisa interact with them while caring for their needs with special foods and medicines was indeed precious. The dedication she has to this four little creatures is beyond reproach. Unfortunately, one of the bushbabies, aptly named, Special Needs," suffers from a brain injury he received when negligently kept as a "pet" and later rescued by Lisa. Sadly, he isn't expected to survive much longer but Lisa is making his quality of life meaningful and loving in the interim. Lisa shared a photo of this baby when he was the size of the end of her finger which may be found here on their Facebook page. But, the remaining three are thriving and growing and, when fully prepared they will gradually be returned to the wild. There are few people who could so lovingly care for these tiny and magical creatures and Lisa, undoubtedly fits the bill. They enjoy maneuvering around the various clothes in the closet. After I fed Doc, the smallest of the three remaining (along with Apple and Bubba) I felt a unique affinity for these little creatures and plan to buy some bananas and yogurt for those that live in the trees near our veranda. I had the opportunity to feed tiny Doc who slowly nibbled on the teaspoon. Deidre, from Wild & Free whom we also met on Saturday night, stopped by last night while we all sipped on wine and snacked on biltong and chips while savoring the steady stream of visitors that freely come to their yard. It was indeed magical. Thanks to both Lisa and Deidre for making these past few evenings extra special for both of us. Please stop back tomorrow for more breathtaking photos and our visit to Kruger National Park! Could it be more beautiful in Tasmania? For more favorite photos of Tasmania as we wound down to our last day, please click here. We made this video four years ago when we had the unique opportunity to see the males fertilizing the white foam nest filled with thousands of eggs laid by the female tree frog. A few days ago, we saw a new white foam nest made overnight by the female, above the pond in the yard. But, we missed the fertilization by the male which must have occurred overnight. A foam tree frog nest, made overnight by the female frog awaiting up to one dozen males to fertilize it. We've been watching for the males but have yet to see them. In this post four years ago, we had the opportunity to see the males fertilizing the nest. After an incubation period of a few weeks, the tadpoles will drop into the pool of water to complete their growth cycle. It's so easy to become caught up in the simple and yet outrageously entertaining life in the bush. Both the human and animal friends provide a steady stream of interesting and somewhat unusual activities we never imagined in our old lives. Each day brings new and exciting opportunities to learn more about nature. Even after the seminars and classes aboard the Antarctica cruise, where we expanded our knowledge about unique scenery and wildlife, we weren't quite as challenged as we are here. This morning upon close inspection, we realized the mating process had transpired during the night while we were sleeping. Today, there are tiny frog footprints on the foam nest indicating the males had already been here. Our post from four years ago and the above video we made clearly shows the process. Fascinating! Who'd ever think of this? The mere 16 nights in the magnificent Antarctic wasn't quite as comprehensive as the education we're deriving now as we continue to discover new species, new scenarios, and animal behavior we never dreamed would roll out before our eyes. We'll post photos of the tadpoles and frogs as they mature. Sure, we witnessed exciting scenarios four years ago but as we mentioned a few days ago we do so now with new eyes and a new perspective. This week, we'll head over to Kruger to discover it's added wonders, much of which we may not experience here in Marloth Park. A bushbuck in the yard considering a drink from the pond. Is it possible we'll ever be bored while we're here? Sure, wherever we may live, there are always a few occasions where boredom may set in for short periods of time. But, our journey has never been about constantly being entertained. Its always been about the magnitude of our experiences superseding any insignificant moments of boredom. The action became rather rambunctious while the baby held his own. During the "movie in the bush" night, prior to the movie starting, Louise was sitting next to me while Tom and Danie sat behind us. Constantly thinking about the comfort and ease of others (Danie is this way, too) she turned to me and asked, "Are you bored? Are you comfortable?" I giggled at her question, answering, "No, I'm not bored. I'm easily entertained!" Could this be mom teaching the young warthog how to protect herself? Later, when I reflected upon her question and my answer, I realized its much more than being entertained. One is not always entertained when engaged in quiet contemplation. One is not always entertained when at any type of event or when at "home" and conversation quiets for a few minutes. The entertainment factor can dissipate to a low hum, hardly detectable in the realm of things. But, boredom is a rare thing, for me, for Tom. This Angulate tortoise that stopped by yesterday afternoon is one of many species of ground tortoises. We offered it some cabbage and carrots but it was too fearful and wandered off. Of course, when the power or Wi-Fi is out, which occurs frequently in most countries, we may experience a period of boredom while we wait for it to return. We don't carry paper books with us when we travel, nor would we want to. However, picking up a paper book during those periods of power outages might be helpful. During outages, we don't use our phones or laptops to read, in the event the power doesn't return by dark. By saving the batteries until dark we are assured we'll be able to read or watch a movie in the dark, should the need arise. We were surprised by how quickly it moved away. Otherwise, we'll play cards or a board game to keep our minds occupied. We noticed there's a huge puzzle here and of course, a dart board and pool table, all of which will keep us busy during outages. Although we don't typically drink alcoholic beverage when its just the two of us, it's not a bad idea to have a beer (for Tom) and glass of wine (for me) during an outage, turning it into a "party for two" while we play pool or darts providing our own form of entertainment. The tortoise had little interest in our veggie offerings. Other than those scenarios, we don't think about being bored nor do we experience boredom. There's always a future booking to research, a country we'd like to see, a place we've longed to visit, providing us with a steady stream of conversation, thought and research. Essentially, what could be more fun than that...making our dreams a reality? May your dreams be realized and you find yourself free of boredom, worry or strife. Happy day to all! 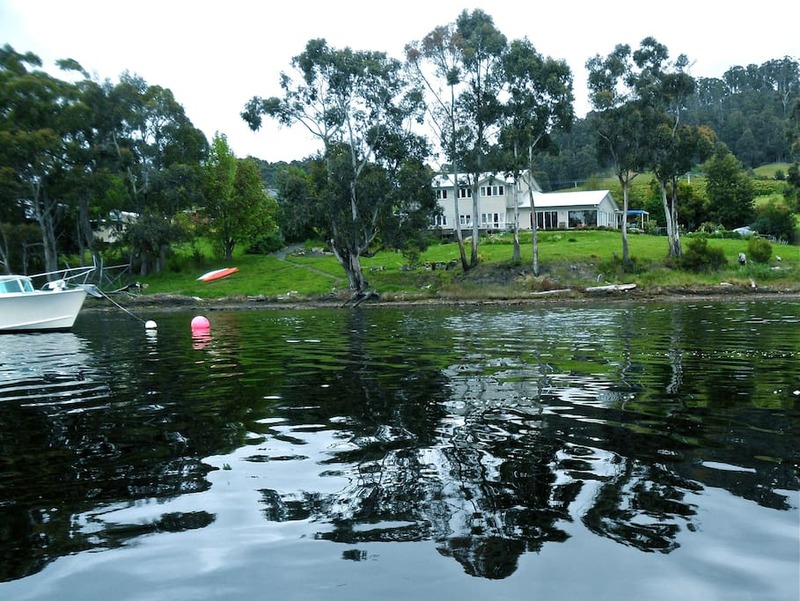 Exterior view of the house on the Huon River in the Huon Valley in Tasmania. For more photos, please click here. "Hmmm..." says Clive to Clove, "I wonder what these humans are up to now. Are we invited?" An apparently happy oxpecker on the hide of a kudu we spotted on yesterday afternoon's drive in Marloth. From this site: "Oxpeckers graze exclusively on the bodies of large mammals. Certain species are seemingly preferred, whereas others, like the Lichtenstein's hartebeest or Topi are generally avoided. Smaller antelope such as lechwe, duikers, and reedbuck are also avoided; the smallest regularly used species is the Impala, probably because of the heavy tick load and social nature of that species. In many parts of their range, they now feed on cattle but avoid camels. They feed on ectoparasites, particularly ticks, as well as insects infecting wounds and the flesh and blood of some wounds as well. They are sometimes classified as parasites because they open wounds on the animals' backs." When Lousie and Danie invited us to a fundraiser, they did so with the thought in mind that our attending this might be ideal for a post for our worldwide readers. The intent was clearly not in having us donate lots of money. About 25 guests had arrived in the bush area for the wildlife rescue event, Wild & Free Wildlife Rehabilitation Centre. Within minutes there were about 50 guests who stayed for the meal, the presentation, the auction and eventually the movie, Out of Africa. With the food hosted by local shop owners and the meat market, the US $8.66 (ZAR 100) per person donation for attendance was a mere pittance for the quality of the experience bestowed on the 50 attendees, most homeowners in Marloth Park or nearby surrounding areas. We may have looked like idiots wearing our bug resistant "Africa" clothes while everyone else was wearing shorts, tee shirts, and flipflops. But, this time we aren't taking malaria pills and feel it's diligent to be careful especially with my weakened immune system after taking so many antibiotics. The mozzies love me. Louise and Danie showed up at 5:45 pm so we could follow them to the site. They also brought chairs for us and sat with us for the entire event, although they were acquainted with almost everyone in attendance. We had a great time at the entire event! Thanks, Louise and Danie!!! The locals are used to applying repellent especially when out at dusk and into the evening when the mosquitos can be downright annoying and also, carrying many types of diseases besides malaria. The event took place on the grounds of a thoughtful homeowner who kindly cooked the fabulous food and hosted the event. After contracting this awful gastrointestinal issue in Fiji which still plagues me today, we'd both decided that we can't be too careful. Illness is the only thing that will put a fast end to our travels and we're simply not willing to take the risk. So we look foolish? Who cares? We're happy and continuing to travel the world. Even now, as I'm posting from the veranda where we spend all of our days there's a variety of bees and hornets buzzing us, let alone mozzies that find me, day or night. A little caution can go a long way in protecting us. Our first visitor to the event, a lone warthog who was curious and perhaps wondering, "Do you have any pellets?" Anyway, back to the event...Louise and Danie graciously introduced us to many attendees which easily brought us into many interesting conversations about wildlife and Marloth Park. She was on her knees eating some greens. 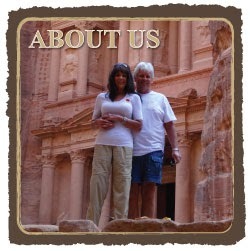 Each person we spoke to freely expressed their unbridled passion for this magical place. Some had been living here for decades, others frequently visiting family who lives in the park. All of the people we met are from one part of Africa or another although the majority are from South Africa. At no point, did we or the other guests feel pressured for added donations. The auctions provided more needed revenue and although Tom bid on a few items we lost to more enthusiastic bidders interested in various types of alcoholic beverages being offered in pretty baskets. Deidre from Wild & Free Rescue Center in Marloth Park did a heartwarming presentation. The food was superb as mentioned here, the movie Out of Africa, which we'd seen many times, was again entertaining. But most of all, the visitors who stopped by to check out the evening's event, left us all in stitches with cell phone cameras flashing along with my camera. A lookout tower on the property. Notice the kudu grazing beneath the structure. Sometimes I could kick myself for not seeking the best possible scenes for taking photos. I certainly have the ability to do so but in my enthusiasm, I get sidetracked by the scene in front of me and I forget to be more diligent. I promise to work on this after it became especially evident to me this morning when I looked at last night's photo. We watched a heartwarming slide presentation of some of the baby animals rescued by Wild and Free Rehabilitation Centre. Why in the heck didn't I get the shots of the visitors with the crowd of humans in the background? This would have created more humorous photos. Thus, I must describe to you that the following animals came to call and hovered around the perimeter of our event: warthog, wildebeest, zebra, and ostrich. Note the tiny bushbaby on the end of a finger. Soon, we'll visit the center and do a more comprehensive story on this exceptional facility. In defense of myself to a small degree, based on the positioning of the wildlife when they hovered around our "camp," I would have had to get behind them to get such a photo. All of these animals weight 100's of kilos (pounds) and doing so may have been risky. One swift kick by an annoyed visitor could result in a tragedy. The food was excellent; pulled pork, pulled chicken, homemade pickle slices, coleslaw, and buns. I ate a little of everything but was concerned about the sugar in the delicious barbecue sauce. Typically, barbecue sauce has a lot of sugar. And so, I ask you to use your imagination and picture the animals shown in today's photos, standing very close to us, smelling, snorting and making a variety of sounds and gestures wondering what we were all about. I could have easily eaten twice as big a serving of the meat, it was so good but I refrained. Tom had one bun filled with pork, coleslaw, and pickles on the side. We noticed the locals putting the pickles in the bun with the meat. That looked good! Throughout the movie, we continued to hear the music-to-our-ears sounds us bush-dwellers continually strive to identify. Tom and I are learning those sounds more this time in Marloth Park as opposed to four years ago. This delightful man sang a few times during the evening. He is Etienne van der Nest also known as the "Cooking Tenor." What a voice and special unexpected treat! Perhaps we're a little wiser, a little more appreciative, and a little more in awe than we were four years ago. A reader wrote to us a few days ago asking, "Since you've been in Marloth Park before, is it any less interesting and magical this second time around?" 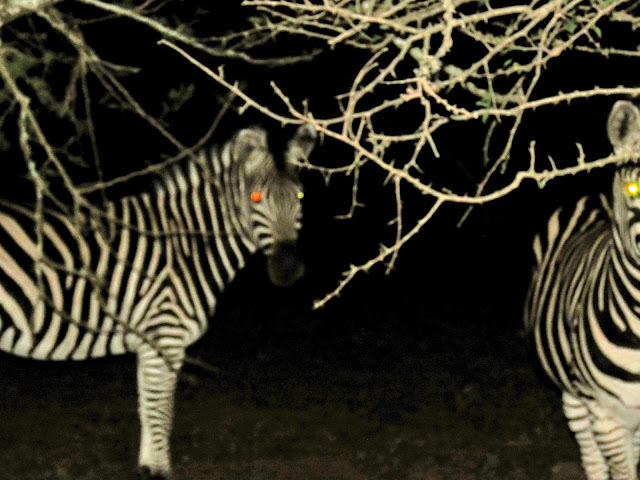 The zebras were hovering around the perimeter of our group curious as to what was going on. We wrote back to our reader, stating it like this, which we've said before, "Being here again is like having an "E" ticket to Disneyland...the anticipation of the "next ride" is almost as exciting as the ride itself." Even when "they" don't visit us, our perpetual state of expectation is indescribable. Louise explained that wild animals are often attracted to the noise of human activity and of course, like the other visitors at the event, curious as to what's going on. For example, the above photo featured in "Sighting of the Day in the Bush" of the oxpecker with its mouth agape while sitting atop a kudu is another of those bonuses we never seek or expect. It's sheer joy in the simplest of terms. Please continue to enjoy the "ride" along with us! Had we arrived a month or two earlier, the hilly countryside in the Huon Valley would have been a lush velvety green. For more photos, please click here.